I have kerneloops installed and with new gdm from karmic the kernoops user is listed as real user in the gdm greeter. so this seems to be a GDM issue. show up, is the only system user listed? On one of my machines, the only interactive user is *not* displayed in the selection box. It sounds as if the criteria for user filtering need to be refined in both directions. should probably be fixed independently. list, which doesn't include a lot of system users. existing users, avoiding this in that manner as well. doesn't help to fix the upgrade from 0ubuntu2, its prerm already kills it. 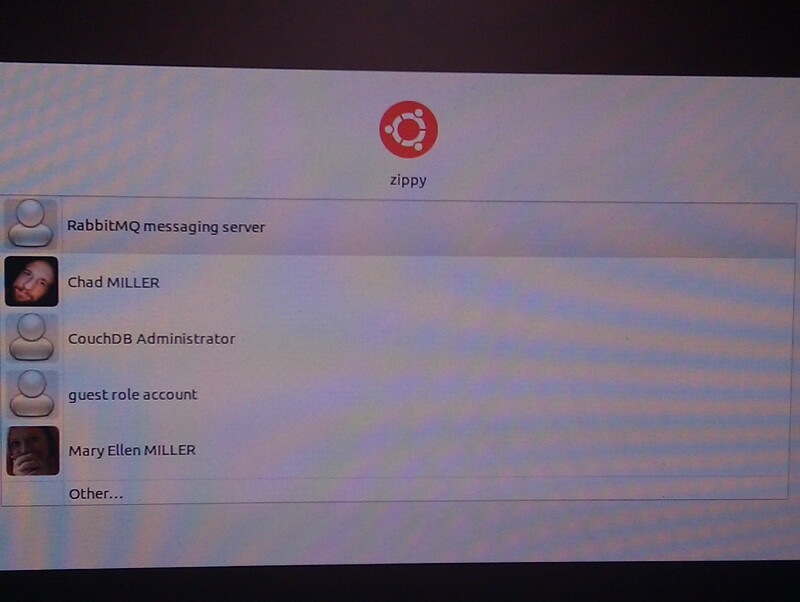 debian/gdm.preinst to migrate the old name to the new name on upgrades. I'm not sure to understand correctly of the information above so here is my question : is it possible to customise the user that should not be shown in karmic without changing their uid to a value lower than 1000 ? I can't seem to open/Confirm this for Natty only. I suspect it's the same problem, for 2.32.0-0ubuntu1 in Natty. My gdm.conf.dpkg-bak has "MinimalUID=1000" in it's [greeter] section, FWIW. Daemon users showing up are rabbitmq (uid 133) and couchdb (uid 127). This is really a bug in the libpam-ck-connector PAM integration. It shouldn't be in common-session, but in /etc/pam.d/login only. /usr/share/pam-configs/consolekit already says "Session-Interactive-Only: yes", so pam-auth-update shoudln't put it in common-session in the first place (as this is also called for cron and the like)? If pam-auth-update can't put stuff into /etc/pam.d/login, then we need to work around this in consolekit itself and filter out system users. Let's not continue to hack around this in gdm any more, it's just wrong, and a waste of IO, cycles, and power to always run consolekit on every cron or at session. > This is really a bug in the libpam-ck-connector PAM integration. It shouldn't be in common-session, but in /etc/pam.d/login only. > place (as this is also called for cron and the like)? No, common-session is the file for "interactive" services; "noninteractive"
coming from cron, that was fixed in karmic. buggy init script; init scripts should use start-stop-daemon, not su. thanks for the clarification. So it seems rabbitmq and couchdb are cases of using "su". I'm a bit undecided whether "login" should really be the only service for pam-ck. It's the main use case for e. g. giving you access to your sound card if you login through a VT, but it's also nice to get that if you do su - otheruser. Ideally we'd only count this as an user session if this actually called the login shell, but that's outside of PAM. So I think the best course of action is to fix CK to ignore system users and also fix the couchdb/rabbitmq init scripts to not use su. Also in my /etc/init.d are ejabberd and pgbouncer using "su". It's far from uncommon to use su in startup scripts - even ones crafted by local sysadmins. I don't think defining 'su' to start a CK session is the right thing to do. Case in point: I crafted a local upstart job to run a java rmiregistry on my machine, and I su-ed it because it has no need to run as root, and no user-changing capability of its own. Later, I started getting spurious "there is another user logged in" warnings when shutting down my computer. It took some considerable head-scratching before I realized the non-obvious linkage here, and then only because I had some small prior experience with CK oddities. pam_limits, to pick one commented out example from /etc/pam.d/su itself. only one symptom of this. This bug affects 11.10 and rabbitmq. The computer will not shutdown via lightdm or gnome session because lightdm thinks rabbitmq is still running. It's worth noting I don't use the ubuntu provided rabbitmq packages. Instead I use the packages from rabbitmq.com . I haven't tested this issue with the ubuntu rabbitmq package. > to start PAM sessions. So if I can't use su, what can I use? I want to start the rabbit process as the "rabbitmq" user, and Erlang programs can't easily setuid(3). I'm not aware of an alternative to su, but I could well be ignorant. Gah, I can't read. start-stop-daemon. > not aware of an alternative to su, but I could well be ignorant.